Please Mark Your Calendars For TOMORROW! AMAZON SPIKE DAY FOR KRISTIN BAIR O’KEEFFE & CINDY HUDSON IS TUESDAY, SEPTEMBER 15TH! 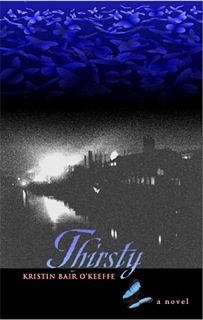 Kristin Bair O’Keeffe’s debut novel, Thirsty, will be published by Swallow Press on October 1, 2009. A family saga that explores domestic abuse, race, class, and Pittsburgh’s mighty steel industry, Thirsty tells the story of Klara Bozic, a Croatian immigrant who seeks the strength-through love and friendship-to leave an abusive husband. Can Klara rise above her circumstances and lay claim to her own peaceful spot in the world? To find out, buy Thirsty on September 15th as part of Kristin’s Amazon Spike Day! I recently interviewed Cindy about her nonfiction book pitching and writing process over at The Writer Mama Riffs blog. You can read the complete interview here. Even if you don’t have a daughter yourself, Book By Book makes a great gift for a mom who does. I hope you will join me in supporting Kristin and Cindy’s Amazon Spike Day on Tuesday, September 15th! I’ll send you a reminder just before the date. Thanks in advance for supporting our long-time columnists. 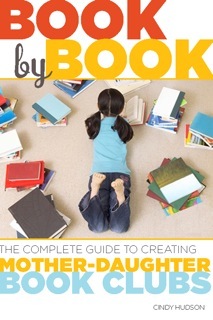 Cindy Hudson is the author of Book by Book: The Complete Guide to Creating Mother-Daughter Book Clubs (Seal Press 2009). Her website, and its companion blog, feature reading lists, book reviews, author interviews, book giveaways and other book club resources. She lives with her husband and two daughters in Portland, Oregon, where she writes weekly for The Oregonian. Visit her online at MotherDaughterBookClub.comCindyHudson.com. KRISTIN BAIR O’KEEFFE has launched a new website and blog. Here’s a sneak peek at her forthcoming novel’s cover. Kristin Bair O’Keeffe’s debut novel, Thirsty, will be published by Swallow Press in 2009. A family saga that explores domestic abuse, race, class, and Pittsburgh’s mighty steel industry, Thirsty tells the story of Klara Bozic, a Croatian immigrant who seeks the strength-through love and friendship-to leave an abusive husband. Can Klara rise above her circumstances and lay claim to her own peaceful spot in the world? Look for Thirsty in Fall 2009 to find out! ABIGAIL GREEN’S essay, “Taking Care,” appears in the new anthology A Cup of Comfort for New Mothers: Stories that celebrate the miracle of life (Adams Media, March 2009). Stay abreast of her success over at Diary of a New Mom. CINDY HUDSON’S Book By Book, The Complete Guide to Creating Mother-Daughter Book Clubs is coming this fall from Seal Press. I recently interviewed Cindy about her nonfiction book pitching and writing process over at The Writer Mama Riffs blog. Check out my recent interview with Cindy on the nonfiction book-writing process over at The Writer Mama Riffs blog. Cindy Hudson announces that her non-fiction guidebook, Bonding Through Books: The Complete Guide to Creating Mother-Daughter Book Clubs, has been accepted for publication by Seal Press in 2010. Bonding Through Books will guide readers through the process of starting mother-daughter book clubs, keeping them thriving as the girls grow and solving problems that may crop up along the way. Hudson’ writes about the topic on her website, www.MotherDaughterBookClub.com, and her blog, www.MotherDaughterBookClub.wordpress.com. Woo-hoo! That was fun. What a talented bunch we are. Also, this e-zine just celebrated an anniversary. That’s right, we’re FIVE years old! Wow. I can still remember starting things up using just my e-mail program and my list of former students back when I was teaching courses at Whatcom Community College in Bellingham, Washington back in 2003. Look how far we’ve come! I probably had about fifty subscribers to start with. Today we have two thousand. I did everything myself back then, too. Over time I’d invite my students to submit their work and we grew and grew to the point we’re at today. These days we have a managing editor (Sage) and two associate editors (Kristin and Cindy), not to mention a total of ten contributors. Today I’ve got one of my former students from back in Bellingham taking my Platform Development class. When I saw the list of writing accomplishments she’d accumulated since then I almost fell out of my chair. A lot can get accomplished in five years…if you stay with it, work hard and don’t let the odd rejection throw you off course. I hope that you guys feel inspired by all the hard work, love of writing, and commitment the ten of us have poured into this e-zine over the past ten issues. I’d like to thank the entire crew: Sage, Kristin, Cindy, Wendy, Lori, Hope, Gregory, Sue and Gigi. And wish everyone a very happy holiday season! We’ll be back again next year with a fresh crew and a new line up of exciting content that will help you stay on course come what may. I’ll be announcing all the details around the first of December. Workman Publishing is a mid-sized publisher, turning out about 40 books a year from its office in New York City. Cassie Murdoch, assistant editor at Workman, says while that’s not a lot of books by some standards, the company puts a lot of energy into each title. And Peter Workman is still very much involved in what makes it to bookstore shelves with the Workman imprint. Here’s Murdoch’s advice to writers who would like to pitch their non-fiction book ideas to her company as well as to other publishers. As an assistant editor, do you have titles you acquire on your own? The assistants at Workman are more involved than at other houses, and we are very much hands on. We also come up with a lot of ideas in-house. Do you accept proposals from authors directly or do you only work with agents? We definitely take unsolicited submissions. Occasionally something comes along that we really like and we go for it. We also work directly with authors we’ve published successfully in the past as well as agents. What catches your attention when a proposal lands on your desk? I look for a great idea I haven’t seen before, or a new spin on an old topic. I have to think, “I want to read that, and I know five other people who would want to read it.” Workman’s books depend on authors who are authoritative in their field, or someone who has a great, unique voice. If I’m reading and I feel like anybody could have written the book, it doesn’t appeal to me as much as something more authentic. What else do you look for? Does the author have some kind of platform? They don’t have to be the pre-eminent expert in their field, but if they have expertise we couldn’t find in anyone else or if they have developed something no one else has thought of, that works too. They also have to be willing to work hard for their book. I think some people have the perception that they worked really hard to write it, and then they’re done. A commitment to the idea they’re working on and a strong interest in the subject are important. Also an online presence is a plus. The author doesn’t necessarily have to have a blog with a million readers, but if this person is part of a community the idea feels more tested. The flip side of that is there may be nothing new for the book. Ideally, an author will still have a lot more content to give. What turns you off immediately in a proposal? When it’s clear the person hasn’t done their research. We don’t publish fiction for instance, so if I get a fiction proposal I know this person is just throwing it at everyone and hoping somebody takes it. I like to know someone has taken the time to find out not only what house is good for a project, but in some cases what editor may have worked on projects similar to their book. Also, I won’t publish something that’s going to compete directly with what we’ve already put out there. What’s a good place for authors to do this research? I always recommend that you find books that connect or relate to your book and see who publishes them. You can often find out who edited a book by reading the acknowledgments page. Keep in mind I’m talking about complementary titles, not competing ones. How far in advance do you acquire titles, and what happens with a proposal you like? Right now (September 2008) I’m mostly looking at Fall 2009 and beyond. When we get a proposal, we often will go back and forth with the author to clarify what they’re going to write. Once we’ve bought the book, we like to agree on where we’re heading and what the time frame is. When we get the manuscript, it’s a very collaborative process that goes on sometimes for a couple of weeks, sometimes for a couple of months. It depends on the length of the book. We work hard to make things happen quickly, but it is really important to us that we don’t rush so much that we lose the standards we have for ourselves. How long does an author spend writing after you agree? On average maybe six to nine months. How does your publicity department work with the author? We have a very involved publicity department. Depending on the project, the publicists may decide to put together a regular tour, or a radio/satellite tour, or sometimes a blog tour. They are really good at finding non-traditional ways to promote our books and making sure we reach the right audience. We also highly value an author who works to promote their book. Murdoch encourages anyone wishing to submit a proposal to Workman to read the company’s submission guidelines before sending something in.